Pundit Press: Obama: Speak Softly and Carry a Big Bat? 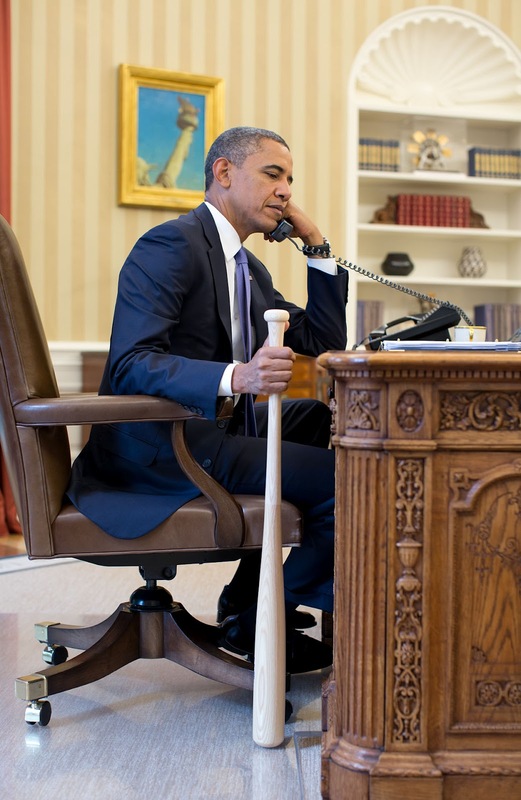 Obama: Speak Softly and Carry a Big Bat? Speak softly while clutching a big bat? Maybe the President really likes baseball, or maybe he's trying to create the image of Teddy Roosevelt's famous "walk softly and carry a big stick" quote for the fall campaign, but either way it's a massive failure. Well, for one if you're trying to create the image of toughness while dealing with foreign leaders - you (a.) don't pick a friendly ally to do it with, (b.) don't post the picture on the internet detailing which friendly ally your using as a campaign prop, (c.) don't use a friendly ally that you need on a crucial and strategic issue - and lastly you don't use the President's liking of baseball to justify an obvious campaign gimmick to foreign press. Oh, also, President Obama had a conversation with Russian President Vladimir Putin, who's opposition to tough U.N. sanctions, or even a resolution condemning the Syrian regime has led to impotency on the U.N. security council and hindered international efforts to resolve the crisis, but apparently didn't feel a photo op would be appropriate that would actually show strength against a foe..... Only our allies, I guess, are game.